Perfect for travel, work, school or home use. Designed with air holes for proper ventilation. The perfect item to keep your toothbrush clean at the office, school, home or while traveling. Available in Ocean Pals (fish, starfish, octopus, crab), Rectangle or Mixed Pack (dino, shark and crocodile) shapes in assorted colors. 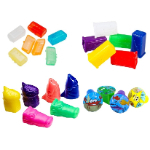 Keep your childrens toothbrush safe with Ocean Pals Toothbrush Covers. 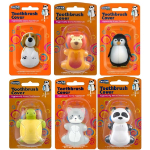 These covers are small enough to make it very easy for kids to take on and off their toothbrush, and contain no clasps or hinges for kids to worry about. Economical option for kids with four different colors available as an assortment in purple, green, yellow, and blue. 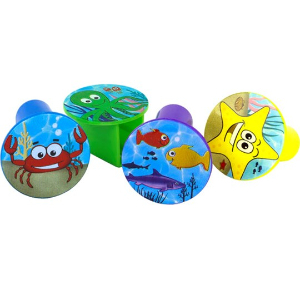 Ocean pals decals include an assortment of fish, starfish, octopus, and crab animals. 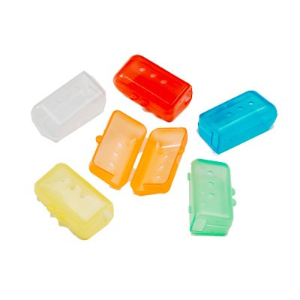 Perfect for keeping toothbrushes clean at school, home or while traveling! 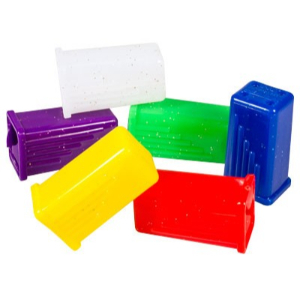 Available in green, purple, blue, red, orange and yellow, these toothbrush covers are designed with air holes for proper ventilation. Great for home, work or travel. The durable covers assist in keeping your brush clean and sanitary when your are on the go. These covers have a fun pop of glitter and are perfect for keeping your toothbrushes clean at school, home or while traveling! Colors include white, purple, yellow, green and red.